1 Laboratorio de Inmunología, Facultad de Ciencias, Universidad de Chile, Santiago, Chile. 2 Unidad de Trasplantes, Clínica Las Condes, Santiago, Chile. 4 Facultad de Ciencias Biológicas, Universidad Andrés Bello, Santiago, Chile. One of the mechanisms for generation of tolerance involves immature dendritic cells (DCs) and a subpopulation of regulatory CD4+ CD25+ T lymphocytes (TREG). The purpose of this work was to analyze how Cyclosporine A (CsA), a widely used immunosuppressive drug, may affect TREG proliferation. Purified and activated murine DCs obtained from bone marrow precursors differentiated with rGMCSF were co-cultured with purified CFSE-labeled TREG from OTII mice, and their phenotype and proliferation analyzed by flow cytometry. Our data indicate that DCs differentiated in the presence of CsA show an altered phenotype, with a lower expression of MHC-II and a lower activating capacity. Additionally, these CsA-treated DCs show decreased production of IL-2 and IL-12 and increased IL-10 secretion when stimulated with LPS, indicating an effect on the polarization of the immune response. Interestingly, CsA-treated DCs show an anti-tolerogenic effect since they reduce the proliferation of TREG cells from 72 to 47%. Further inhibition to a 24% of TREG proliferation was obtained as a direct effect of CsA on TREG. In conclusion, the anti-tolerogenic effect of CsA should be considered in the planning of immunosuppression in the context of clinical transplantation. Dendritic cells (DCs) represent a heterogeneous population of uniquely well-equipped antigen-presenting cells that link innate and adaptive immunity and initiate and regulate immune response (1). Additionally, DCs control immunity through their ability to induce antigen-specific unresponsiveness of lymphocytes in primary and secondary lymphoid tissues. It has also been shown that subcutaneous administration of autologous immature DCs induces antigen-specific T cell tolerance in human volunteers (2). This, as well as results from several other groups, have led to the notion that a state of immune tolerance can be elicited by immature DCs (3). The initial demonstration by Nishizuka and Sakakura (4), later confirmed by Sakaguchi et al. (5) that a subpopulation of T lymphocytes actively down-regulate immune responses, challenged traditional immunology concepts. Sakaguchi et al. demonstrated that mice depleted of CD25 expressing cells developed various autoimmune diseases, and that this phenomenon could be reversed by reconstituting the animals with this same cell population (6). Thus, these regulatory T cells (TREG) were able to inhibit the immune reactivity of T cell clones specific for self-antigens. Cyclosporin A (CsA), an immunosuppressive agent widely used in a variety of conditions such as organ transplant and autoimmune diseases, acts by blocking the transcription of the gene encoding IL-2. It has been shown that in the autoimmune disease-prone athymic nu/nu mice, autoimmunity can be prevented by the transfer of thymocytes suspensions obtained from normal nu/+ mice, but not by thymocytes from CsA-treated nu/+ mice (7). Thus, CsA appears to interfere selectively with the thymic production of certain T cells regulating the activity of self-reactive (autoimmune) T cells, allowing the latter to expand and cause autoimmune disease. It has been also been shown that CsA exerts immunomodulatory effects on human DCs, inhibiting IL-12 production and Thl skewing (8). Moreover, results from our laboratory, as well as others, indicate that CsA also blocks IL-2 secretion by murine bone marrow DC (BMDC) (9). These results are particularly relevant if one considers recent results by Furtado et al. (10) showing that in a model of spontaneous experimental autoimmune encephalomyelitis, IL-2 signaling is an absolute requirement for TREG cells to exert their autoimmune protective function. Recently, Kawai M et al. (11) showed that in vivo administration of CsA in high doses inhibits the proliferation of CD4+ CD25+ TREG cells, while at low doses it favors TREG proliferation. In spite of these apparently contradictory effects of CsA on TREG cells function, to our knowledge there is no report addressing the question as to whether CsA inhibits TREG activity by acting directly upon these cells or indirectly owing to its action on DCs. Here we report that dendritic cells, generated from bone marrow precursors in the presence of CsA in a concentration of 750 ng/mL (representative of the standard Cmax, i.e. the maximal CsA blood concentration used in maintenance immunosuppression in clinical transplantation), reduced Treg proliferation. This inhibitory effect of CsA was enhanced when the drug was also present during co-cultures of DCs with T cells. In addition, we report that bone marrow-derived DCs generated in the presence of CsA show a more immature phenotype, a lower IL-12 and IL-2 secretion post-activation and an enhanced IL-10 production compared to DCs generated in the absence of the drug. These results show that CsA produces an ambivalent effect in DCs: on the one hand it sustains an immature potentially tolerogenic DC phenotype, while on the other, it actually reduces TREG proliferation, probably due to changes on the cytokine pattern secretion. Mice: C57BL/6 H-2b (B6) mice were purchased from Jackson Laboratories (Bar Harbor, ME) and OT-II CD4+ transgenic mice were obtained from The Scripps Laboratories (San Diego, CA). These TCR transgenic mice recognize a peptide derived from OVA (positions 323-339) in the context of I-Ab. Mice were used at 8 to 12 weeks of age and housed in a specific pathogen-free facility. Bone Marrow Dendritic Cells: Bone marrow DCs were generated as described previously with minor modifications (9). Briefly, bone marrow cells were removed from the femurs and tibias of B6 mice and depleted of erythrocytes by hypotonic lysis. The cells (1 x 106) were cultured for 5 days in 1 mL of RPMI 1640, supplemented with 10% v/v FBS, murine recombinant GM-CSF (10 ng/mL) (Pharmingen, USA) in the presence or not of CsA (750 ng/mL) (Sigma, St Louis Missouri, USA), at 37°C and 5% C02. At days 2 and 4, 75% of supernatant was replaced with 1 mL of fresh media (with rGM-CSF ± CsA). At day 5 cells were harvested and incubated with bead-conjugated anti-CDllc monoclonal antibody (anti-CDllc kit, Miltenyi Biotec, USA) for 15 min at 4°C DCs were purified with magnetic columns by positive selection according to the manufacturer's instructions. The purity and phenotype of the DC was analyzed by flow cytometry. DC activation: CDllc+ DC purified on day 5, were re-plated at 1 x 106 cells/ml in 250 ml of RPMI 1640 supplemented with 10% FBS and rGM-CSF ± CsA (750 ng/ mL) and activated with 100 ng/ml LPS (Sigma, St. Louis, MO, USA) as indicated. After 4 h of incubation, supernatants were harvested and tested for mouse IL-12p70, IL-10 and IL-2 using enzyme-linked immunosorbent assay (ELISA) kits (BD PharMingen) according to the manufacturer's instructions. CD4+ regulatory T cells (TREG): CD4+ regulatory T cells were isolated from the spleen of OT-II mice using an immunomagnetic isolation kit (Miltenyi Biotec, USA). Spleen cells were treated with a cocktail of monoclonal antibodies that deplete all the cells, except CD4+ T cells then CD4+CD25+ regulatory T are isolated by selecting cells for high expression of the CD25 marker by immunomagnetic selection. The phenotype of the purified cells was confirmed by flow cytometry for the expression of intracellular Foxp3. Treg cells were resuspended in 500 mL of RPMI 1640 media without serum and stained with CFSE (5 mM) (Molecular Probes, Eugene Oregon, USA). After 10 min of incubation at 37°C, the cells were washed twice with RPMI 1640 supplemented with 10% v/v FBS. Co-cultures: DC (1.5xl04) were resuspended in 150 |iL of RPMI 1640 supplemented with 10% v/v FBS ± CsA and activated for 4 h at 37°C and 5% C02 with 100 ng/mL of LPS in 96-well culture plates. Following this, OVA (0.2 mg/mL) was added to the wells, and 30 min later TREG cells resuspended in 150 |iL of RPMI 1640 supplemented with 10% v/v FBS, were added to the cultures. Co-cultures were left at 37°C and 5% C02, and at day 5 cells were harvested for flow cytometry analysis. Flow Cytometry: The DC phenotype was studied using fluorochrome-conjugated antibodies (anti-CDllc-PE (HL3 clone), anti-I-A/I-E-FITC (2G9 clone), anti-CD80-FITC (16-10A1 clone), anti-CD86 FITC (GL1 clone), anti-CD83 APC (Michel-19 clone) and anti-CD40 APC (1C10 clone). To study the TREG phenotype and proliferation, cells were harvested at day 5 of co-culture, resuspended in RPMI plus 2% FCS, stained with the relevant mAbs for 20 min at 4°C, washed, and analyzed on a FACScan (BD Biosciences, Mountain View, CA) using the Cellquest program. The following mAbs from PharMingen were used: anti-CD4-PerCP and anti-CD25-PE. CFSE dilution was analyzed together with the expression of these markers. Considering that TREG function has been shown to depend upon IL-2 and that CsA inhibits the secretion of this cytokine by T cells and DCs (9), we sought to determine the influence that DCs generated in the presence of CsA had on TREG proliferation. In one set of experiments, CFSE-labeled TREG isolated from OTII transgenic mice were co-cultured with peptide-pulsed BMDC in the absence of CsA. Under this condition, TREG showed a proliferation of 71.9% (Fig. 1A). On the other hand, when CFSE-labeled TREG were co-cultured with peptide-pulsed BMDC differentiated in the presence of CsA, TREG proliferation decreased to a 47.4% (Fig 1D). Since in these experiments no CsA was present at the time TREG were added, the effect of the drug on Treg proliferation could only be attributed to its prior interaction with DCs during their differentiation. Additionally, when CsA was also present during the period of co-culture of the CFSE-labeled transgenic Treg with the peptide-loaded BMDC, proliferation was further diminished to values close to 25%, irrespective if the BMDC were generated in the presence (Fig. 1B) or in the absence of CsA (Fig. 1C). 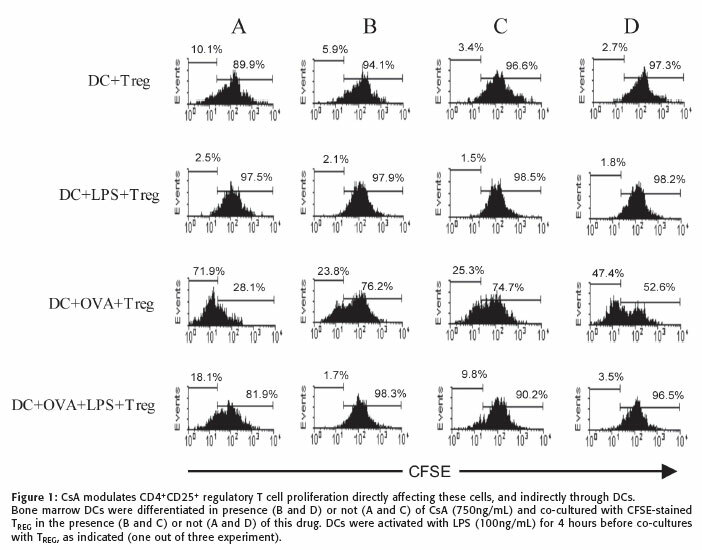 Moreover, when DCs generated in the presence of CsA were pre-activated for 4h with LPS and then peptide-pulsed and co-cultured with TREG for the time of the experiment, TREG cells did not show any proliferation (last row Fig. 1) indicating that activated BMDC do not sustain proliferation of TREG. 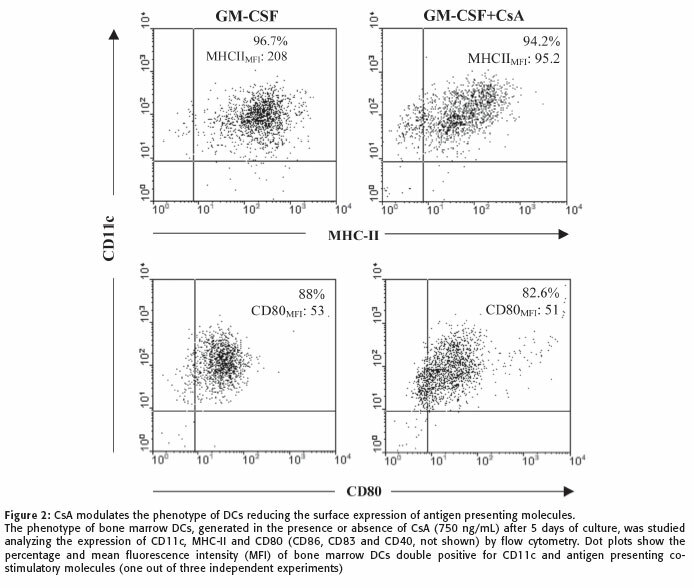 To examine the effect of CsA on BMDC differentiation, bone marrow precursors were cultured in the presence of GM-CSF ± CsA (750 ng/mL). After 5 days of culture, the resulting BMDC were purified through magnetic column as indicated in Material and Methods and stained to analyze by flow cytometry on the CDllc+ DC, the surface expression of several maturation markers, such as MHC-II, CD86, CD83, CD40 and CD80. As a representative result Figure 2 shows that although no differences could be detected with regard to the percentage of cells positive for these markers, there is a marked reduction in the mean fluorescence intensity (MFI) for MHC-II on DC differentiated in the presence of CsA, indicating that this drug decreases the antigen presenting capacity of these cells, while it does not affect the expression of other co-stimulatory molecules. However, when CsA-treated BMDCs were activated with LPS for 4h, the most remarkable effect was on the expression of CD86 marker, since there was almost no increase in the percentage of CD86+ cells, contrary to what happens with all other markers (data not shown), suggesting that BMDC differentiated in the presence of CsA are in someway more immature DCs. In view of the impact of CsA on DC maturation, we decided to analyze the effect of CsA on the cytokine secretion pattern of DC in response to an inflammatory stimulus. BMDC differentiated in the presence or absence of CsA were stimulated with LPS (100 ng/mL) for 4 hours and the supernatants harvested for cytokine analysis. The results indicate that DCs differentiated with GM-CSF alone secrete IL-2, IL-12 and IL-10 in response to LPS, while DCs differentiated in the presence of GM-CSF plus 750 ng/mL of CsA, secreted significantly less IL-2 and IL-12, while IL-10 secretion was slightly enhanced as compared to non-treated DCs, suggesting that DC-treated with the drug may differentially influence lymphocyte polarization (Fig. 3). TREG are a subset of T cells that regulate the immune response to self and non-self antigens and may prevent or down regulate the effector arm of the immune response. For example, in solid organ and tissue transplantation, co-transfer of TREG into T cell deficient mice along with CD4+CD25+ effector T cells block the ability of these effector T cells to reject allogeneic skin grafts (13, 14, 15) indicating that TREG play a role in inhibiting transplant rejection and achieving tolerance in animal models. The best-characterized TREG have been isolated by their constitutive surface expression of CD4 and CD25, the high affinity alpha chain of the IL-2 receptor. IL-2 seems to be necessary for the proliferation of TREG cells as suggested by studies showing that TREG are absent in IL-2 deficient mice (16). It has been shown that CsA inhibits the proliferation of TREG in vivo (11) a phenomena that was envisaged in the early 80's (17). This effect may happen by a direct action of CsA on the Treg or indirectly through an effect upon the stimulatory and antigen presenting DC. Recent reports indicate that DC produce IL-2 (18) and that CsA act on murine bone marrow DCs, inhibiting IL-2 production and inducing an immature state and a reduced secretion of Thl cytokines, suggesting an additional and potential role of this drug in the generation of transplant tolerance (9). In this study we focused on the relationship of CsA-modified DC and TREG in order to determine the changes that CsA might indirectly produce in these cells following antigen presentation. The topic is relevant in the setting of clinical transplantation when recipients are treated with anticalcineurinic since day one. Accordingly, bone marrow DCs were generated in the presence or absence of CsA and then co-cultured with purified Treg cells isolated from TCR transgenic mice. TREG were previously labeled with CFSE to analyze their proliferation in the different conditions as described. As Fig 1 shows, there is no TREG proliferation in the absence of antigen (OVA peptide). In contrast, OVA-pulsed bone marrow DC induced a robust 71,9% TREG proliferation (Fig 1A). When CsA was added during DC differentiation, but was absent during TREG activation, proliferation reached a value of only 47.7% (a representative result out of three experiments). Thus, the fact that DC produced in the presence of CsA reduced the proliferation of TREG when compared to DC generated in the absence of the drug (Fig 1) demonstrate that CsA, by acting upon the DC is capable of weaken TREG proliferative response. On the other hand, the presence of CsA during the generation of DC and the period of co-culture with TREG (Fig IB) produced an additional reduction of TREG proliferation (23.8%), confirming previous data showing that CsA have a direct negative effect on TREG. In conclusion our findings show that DCs lose an important proportion of their capacity to induce TREG proliferation after being generated in the presence of CsA, even though an altered phenotype of DC was generated after treatment with the drug, as shown by the decrease in MHC expression and CD86 after LPS treatment. The pattern of cytokines secreted by DC differentiated with CsA in response to an inflammatory stimulus, such as LPS showed a dramatic reduction in IL-2 and IL-12 secretion and an increase in IL-10 production. These experiments demonstrate that CsA, through their action on DCs precursors impacts negatively on TREG population. These results agree with recently published results where the authors compared the capacity of CsA and other well-known immunosuppressive drugs on the proliferation and functionality of TREG (21) or on the balance TREG/Thl7 (22), both showing a negative impact of CsA on TREG function. Further in vitro studies using a wider range of CsA concentrations may provide new insights into the complex actions of this drug on DC and TREG proliferation. This work was supported by grants from FONDECYT 1100448 (to MR), 1100557 (to MRB), and 1080416 (to AF); and Grants DI 03-02 from Universidad Andrés Bello and CONICYT PFB-16 (to MR). Received: July 2, 2010. In revised form: August 9, 2010. Accepted: August 12, 2010.